Thomas Conveyor & Equipment Company, Inc. was founded in 1976 by Thomas J. Lisy Sr. With a degree in electrical engineering from Case Western Reserve, Tom had a vision to start a systems integration company with a team of experienced, highly trained engineers and project managers. 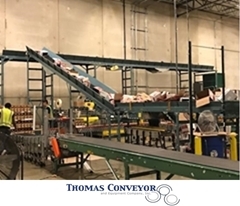 Today that vision has grown as Thomas Conveyor and Equipment is recognized as the premier source for conveyors, ergonomic equipment, pneumatic conveying systems, and mezzanines and lifts. Experience the dedication and detail that the TCE team will bring to your next material handling project.